Garages don’t commonly have windows, and this makes lightening very essential for working in garages especially at night. Even when a garage has larger openings, the light that passes through those openings is insufficient, especially while working at night. You want to get the best possible lightening to make your workplace brighter so you can easily see as you work. Making a bad choice could mean buying garage light over and over again. 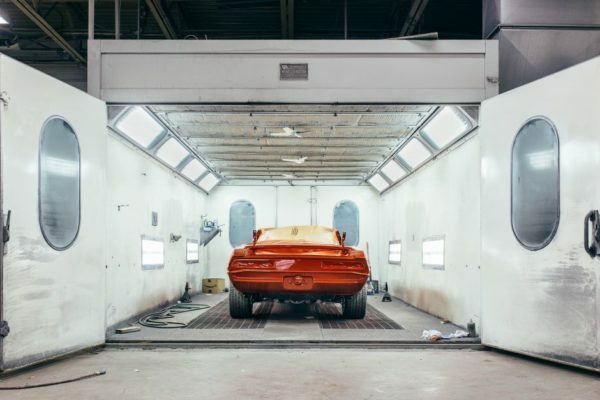 It can be daunting to sift through the market for the best garage lightening system. We want to make the task easier for you by providing you with tips to make the right choice. We have also provided our top 7 picks of the best garage lightening system. The Hyperikon LED 2ft lightening system comes with the brightness value of two thousand and two hundred lumens. Although this brightness value is a bit lower than three thousand five hundred which is the recommended standard, the brightness is still sufficient for the majority of users. It also features motion-sensors which means you don’t need any switch to turn the light on or off. The lightening system features a sturdy and durable exterior which is great. Besides, the bulb is also sturdy and this means you have a lightening system you can enjoy over a long period of time. Additionally, it comes with amazing thirty-five thousand hours of bulb life. Also, it is energy efficient given its LED system. Bulb life of thirty-five thousand hours. The PrimeLights 4 bulb is another great garage lightening. However, this is more affordable than the Hyperikon LED 2 light. It is not as bright as Hyperikon, though. This gives you eleven thousand, four hundred lumens of light and lasts for a maximum of fifty-thousand hours. You’ll also get a sturdy and long-lasting casing made of steel. The lightening system lacks motion-sensors and that means you have to turn the switch off and on. It is also energy efficient given its an LED system. Sturdy and durable steel casing. This garage lightening gives you fifty thousand hours of bulb life. You also get a whopping 4000 lumens of light which is higher than the recommended average. If you want to use the light for a wider space, you can use daisy chain wiring to link up to four lights. The LEDs works well without flickering even during the winter season. It is energy efficient and consumes roughly sixty-five percent less energy than a standard fluorescent bulb. It comes with chain hangers which makes installation easy. You’ll need to purchase an extension wire, though, as the plug-in cord of the unit only has the length of five feet. It comes with fifty thousand bulb-life hour. This Hyperikon LED Shop Light is another good garage light. It is a bit pricier than the Sunco light. You get four thousand lumens of brightness, which is above the standard recommended value. Depending on your garage, you may need to get a second light to get more widespread coverage. The LED minimizes flicker and makes the light come on instantly. In winters you can use it with other tools like garage heater as it consumes less electricity. It can also come with a color temperature of five thousand Kelvin. With the lifespan is 45,000 hours, you may not need to ever purchase another garage light. 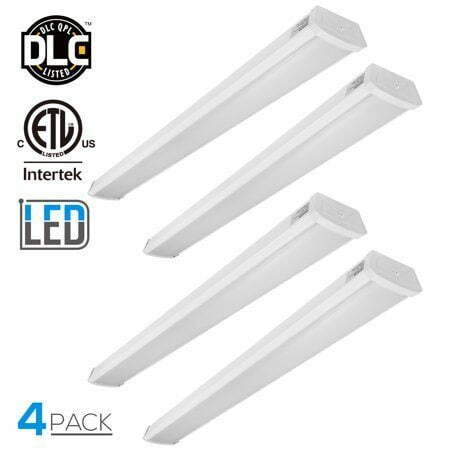 It is easy to install and you can easily connect up to four light in series and turn them on all at once. The LeonLite Shop Light is a flexible garage lightening option suitable for big garages that need many lights. You can connect a maximum of five lights in series using the linkers that come with the pack. You get a four thousand lumen brightness which is above average recommendation. Also, with a large bulb lifespan of 50,000, you may not need to purchase another light for many years. 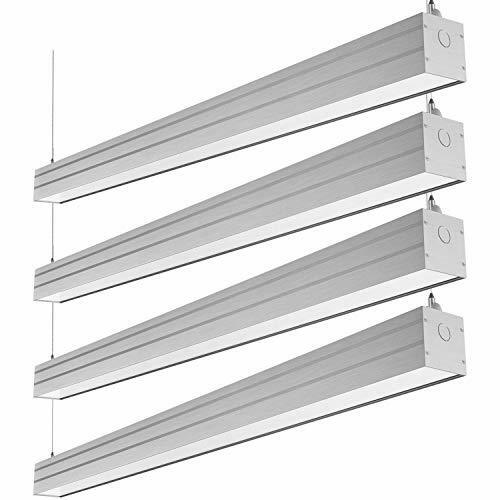 Besides, it is energy efficient compared to the standard fluorescent lights. It comes with a minimal casing. However, it is sturdy and durable backed by PVC. It is easy to install. The light comes without protection and can easily deteriorate. This garage light from Hykolity comes with brightness higher than the average recommended three thousand eight hundred to four thousand lumens of light. 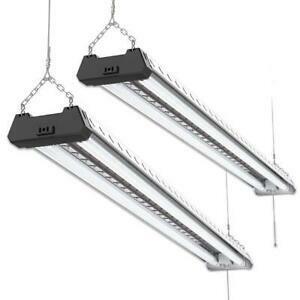 It is related to the Linkable LED Utility Shop Light. However, this comes with a double lifespan and is more cost-effective if you purchase four lights. It is as well energy efficient and won’t hike your electricity bill. 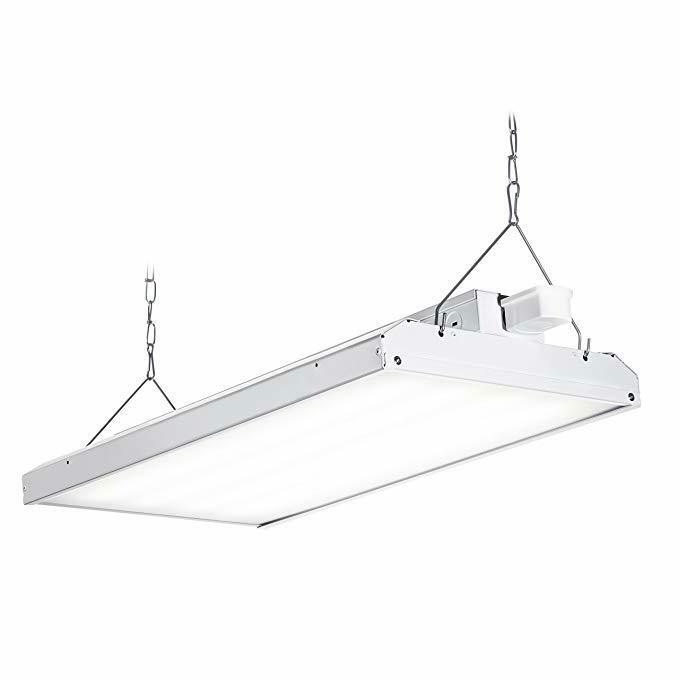 You can install the light either by suspending on the ceiling with an easy to set up a chain or through surface mounting. If you want to mount the light glow with the ceiling or straight into the wall, you can equally easily drill the screws via the aluminum fixture. It has a prolonged bulb life of 50 thousand hours. 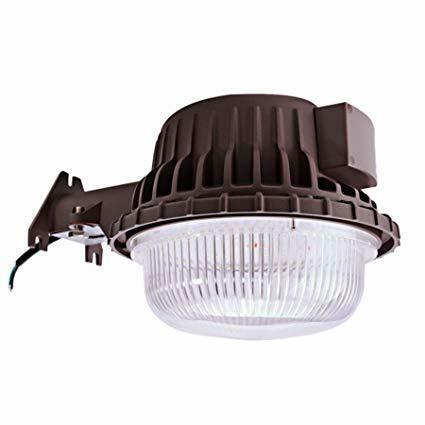 The Bobcat Dusk to Dawn LED Yard light system is structured to be used outdoors. It comes with a solid build and with a cast aluminum casing, it can stand rough handling. 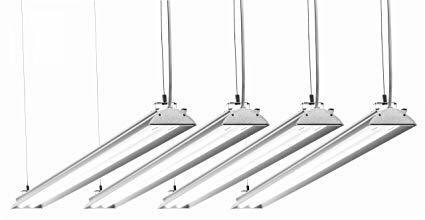 The lightening system comes with five thousand, three hundred lumens of brightness, and could cover a distance of up to thirty foot. It comes with everything you could desire in an outside garage light. The automatic lightening activation means that you don’t have to do anything to turn it on or off. The light automatically turns on at dusk and goes off at dawn. Despite, its unique features and suitability for outdoors and exteriors of the garage, it is affordable. Look for lighting systems that have fixtures that prevent them from deteriorating easily. A case for the light means you are protected from accidents that could occur from forceful and powerful work tools that could damage the light. The primary reason for buying a garage light is to make your workstation brighter. The brightness of the light is measured in Lumens. Higher lumen lights are brighter than smaller lumen lights. The majority of garage lightening systems come with the brightness of 4000 lumens but even light with 3500 lumens is sufficiently light enough. You can get lights with higher lumens of roughly 8,000 lumens. But you don’t want to go as high as that as it can be blinding due to too many reflections. Choose light brightness that is suitable for your lightening needs. The majority of standard LED garage lights come in color temperatures of roughly four thousand to five thousand Kelvin temperatures. These lights look much the same as the natural color of daylight. Lights with a bit lower temperature look more bluish while those that are higher than those ranges appear more orange-like. You need to consider how you want to install the lightening system before choosing an option. Factors like: whether you need a lightening system mounted straight above your workstation, consider, what is most suitable in you situation-a hanging light or a light installed flush to the wall. You also need to consider the height of your garage. Check to ensure that the lightening system you want to buy is certified by the Underwriters Laboratory (UL) or Edison Testing Laboratory(ETL). Lightening options with these certifications fulfill the minimum safety requirement stipulated by the Occupational Safety and Health Administration. LED lights are more energy efficient than the standard fluorescent lights. Besides, they are also environmentally friendly. To compare the energy consumed by these two lights you can compare 4,000-lumen lights to 40-watt light of the fluorescent bulb to get an idea of which consume more energy. Unless you are an electrician with a good knowledge of electrical wiring system, you’d want to get a lightening system that you can easily install. Although you can get an expert to help with the installation, you may end up paying a higher overall cost. So, factor this in to determine which one is the most suitable lightening for your needs. Your garage light would either make or break your garage working experience. 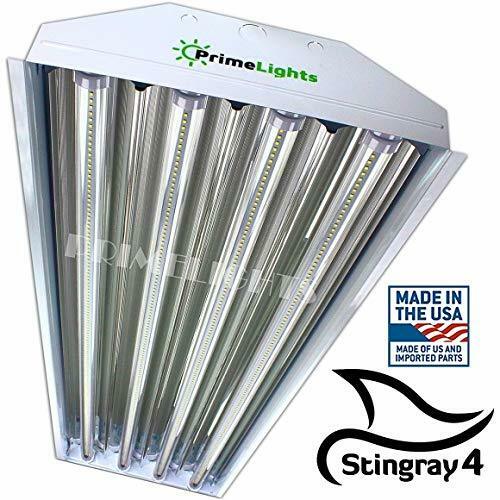 We have provided in this articles tips that’ll help you to pick the best garage light and also presented our top seven picks. Hopefully, this information would make it easy for you to choose the right garage lightening option for your need. Let’s know how you get on.